This tree sits atop the hill near City Hall in Portsmouth. 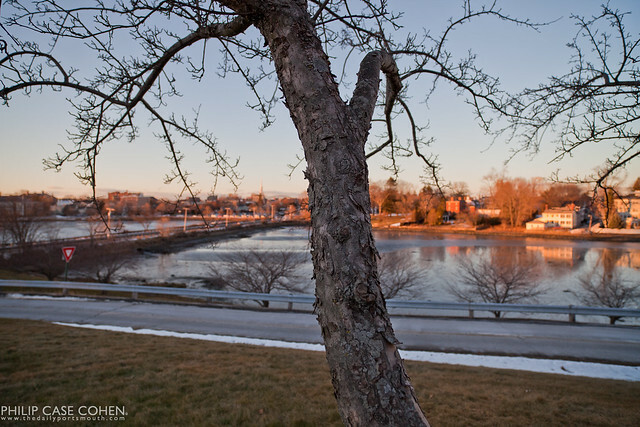 In the distance, the North Church and the Piscataqua River Bridge can be seen glowing in the late afternoon sunlight. I’ve been hugely influenced lately by a classic large format photographer, Joel Meyerowitz. After picking up a couple of Joel’s classics, I’m now smitten with the atmosphere and mood and natural colors presented in a scene. This shot is a step in that direction, as no heavy processing could truly capture the softness of the blue sky and the contrasting rich orange sunlight against the detail of the tree in the foreground. It definitely helped having a piece of glass that can truly render the subtleties of the gorgeous color and detail, thanks Zeiss! Because of your beautiful photos of Portsmouth, we made a stop on our Xmas trip to Maine and stayed two nights in the town. It was worth it.